If you are looking for a new fun and exciting place to take some art classes in Ponchatoula then you have to check out Painting with a Twist in Hammond. It is more than just your average art class, it is a party as well. It is a great place to relax and have a good time while you paint a masterpiece. Most everyone who takes a class here goes home with a beautiful painting that they had no idea they could actually paint. Yes, if you have no art experience at all or you have been painting for a while this is a great place to discover or rediscover your inner artist. When I took my first class I was shocked to learn how easy and how much fun it is. I promise you after you take your first class you will become a regular. Located on 204 E. Thomas Street in Hammond, Louisiana only 10 minutes from Ponchatoula. Painting with a Twist in Hammond has been such a success because everyone goes home with great art with a great experience for a low price. For the price of the materials to paint the painting you can take the entire class. Yes, $35 dollars for a two hour class and $45 dollars for a four hour class and you will have a trained artist walk you through the entire experience. All you have to do is book your class online to get started. 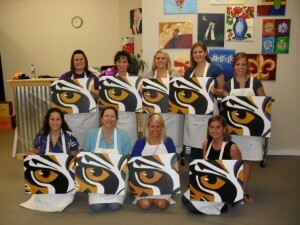 To book a class today, just visit their website at Painting with a Twist Hammond. Search their calendar for a perfect painting on a perfect day and add it to your cart. When you are ready you can checkout and you will be asked to fill out a reservation form for the event. Once you submit the form they will ask you to make payment to secure your spot. That is all it takes to setup your art class at Painting with a Twist. When you arrive a few minutes early to check in they will give you a canvas and all the rest of the supplies you will need to paint your masterpiece. All they ask is that you bring in your favorite beverage to enjoy the experience. Wine is most popular at a Painting with a Twist class. Enjoy the class and happy painting! This entry was posted on Sunday, April 4th, 2010 at 10:56 pm	and is filed under Events. You can follow any responses to this entry through the RSS 2.0 feed. You can leave a response, or trackback from your own site.